The Toxic Remnants of War Project was launched to consider and quantify the detrimental impact of military activities and materials on the environment and human health. Andy will describe the environmental footprints of ISAF and NATO including what they are leaving behind through the closure of bases and firing ranges, as well as the waste disposal practises that pose a serious threat to civilian health. Chris Cole is a tireless investigative campaigner, he will be outlining the case against drones from his research into the use of British military drones in Afghanistan and the environment of official secrecy and obfuscation. Afghanistan has been the testing ground for Britain's growing drone arsenal bought from US and Israel. We will hear about the co-operation between these countries and the global significance of the use of drones by focusing on Afghanistan, the "drone capital" of the world. Frank's book looks at the cost of war both to lives and financial, some of his damning calculations include: by 2020 the Afghan war will have cost British tax payers £40bn – enough to run 1,000 primary schools for 40 years or to recruit 1,000 nurses and pay for their entire careers. The book has been described as "a masterpiece in miniature" by New Statesman. This Skype connection will enable us to hear the inspiring women Afghan peace activists who have chosen to reject the status quo of violence and look for alternative solutions for their war torn country. There will be an opportunity to address questions. It is likely Dari will be the main language spoken as the workshop will talk live with men and women from the Afghan Peace Volunteers in Kabul to Afghans in the UK. Facilitated by Afghan community organiser Sabir Zazai. Photojournalist Guy Smallman will talk about the Street Angels Project which involved giving a group of street children some photography lessons and a bunch of disposable cameras, the results were remarkable. Caroline Mylon from UK Friends of Aschiana will talk about their educational programmes they run with street kids. 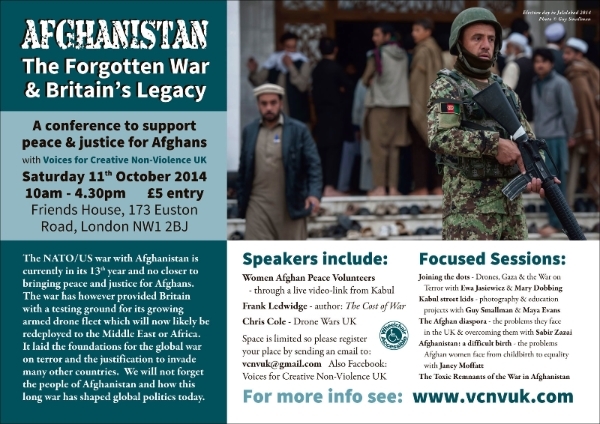 The workshop will include testimonies from Farzana and Yagana, two Afghan women who have recently fled Afghanistan, as well as film maker Janey Moffatt who will premier her short film "Afghanistan: A Difficult Birth". With investigative journalist and campaigner Ewa Jasiewicz and VCNVUK’s Maya Evans who will make the connections between all the factors which are making these wars possible, linking the common causes and drivers, and attempt to join the dots to link peace campaigners together in a combined effort. Facebook "Voices for Creative Non-Violence UK"